I've only been once so far, but I'm already feeling pretty optimistic about Red Corner Asia, the new Thai restaurant in the Ruen Pair/Ban Khanom dessert shop minimall at Hobart and Hollywood. The shiny new space was opened by the owners of the sweet shop, and thus the menu features a much larger dessert selection than usual. Red Corner Asia is clearly aspiring to be more than the average Thai restaurant, with ambitious dishes and a touch of actual decor. It's always a good sign when you wish you had brought several more people so that you could try more things on the endless menu, but we managed to try three dishes, all seafood. 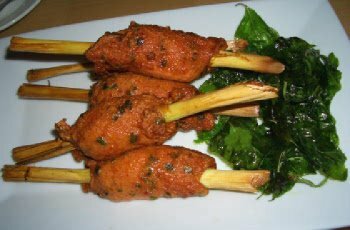 We started with the fish cakes on sticks, an excellent rendition of the traditionally flat fried fishcakes. They were golden brown and uniquely formed around green onions, making a nice change of pace from the round pucks. Then we had grilled squid salad, with tender pieces of squid on a bed of iceberg lettuce with a spicy, sour dressing. 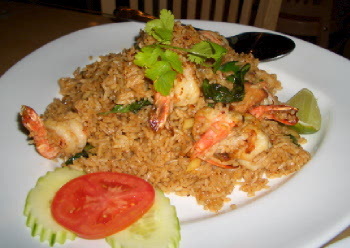 We also tried the Tom Yum fried rice, which transposes the flavors of a tom yum soup to fried rice. The rice was moist and saucy rather than dry and fluffy in the Chinese style, but deliciously full of lemongrass, garlic and plump shrimps. Red Corner has an extensive barbecue menu, including Volcano chicken -- a whole marinated chicken with fire shooting out the top. I'm also interested in Eggs in Disguise with Holy Basil Leaf, seafood dishes like bacon-wrapped scallops and some other variations like crab pad thai, salmon with spicy basil and herb & spicy shrimp. Verdict: This place looks like a keeper, but I'm going back tomorrow night to try some more dishes. Prices for some of the more elaborate seafood dishes are higher than the typical Thai spot, but other dishes are in the normal $5.95 and $6.95 range. There's no beer or wine -- perhaps you can bring your own. Open for lunch and dinner. More dishes on this update review.